Here’s a headline: Bristol’s Bolsheviks’ Bring It! … “Ok”, you say, “smart guy”. “What is it that these Bolsheviks are bringing?” Well sir, it’s the muthafukin’ rock and roll for one and for two refer to number one. 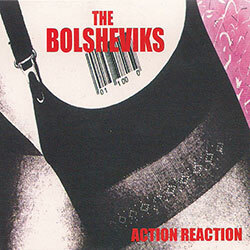 Seriously though, Action Reaction, the new CD from The Bolsheviks is hard to place but hard to put down at the same time. It is an eclectic mix of sound. I hear flashes of spacial sounding guitars ala Voivod and hard driving bass lines akin to Hogan’s Heroes. Hell they even remind me a bit of the Cadillac Tramps on track 6 “Stole My Name”. With all that is a crazy mash up of haunted house psychobilly grooves and an undeniable mod rock Clash factor. Though in all fairness I have no idea if these blokes ever listened to either of those bands, I do know there is a bit o’ psycho in ’em. The Bolsheviks formed in 2005 from the remnants of bands such as Lux, Rout and Misdormeanour. The wide-ranging prior influences of the collective memebers comes together for what works out to be a damn good CD. Apparently the band forewent any digital recording on the CD and went full analog. This decision lends well to the rather basement dwelling / garage haunting vibe that Action Reaction is all about. 11 tracks that combine punk, rock, psycho and and a strong retro vibe. If you can find them on this side of the pond, by all means do. Otherwise I suggest packin’ up the fam and moving to jolly ol’ England to catch some of this.